Here at Bigfoot our vision is to harness and use the power of a creativity to unlock children’s potential and help them discover their spark which will inspire them to learn and strive for excellence. All of our programmes are designed to engage and provide inspiration for students, but this can only be achieved through our amazing Bigfoot Facilitators and their excellent delivery. We love when our vision is very apparent in the work that we do with schools and that’s exactly the experience we had recently with Rathfern Primary School. 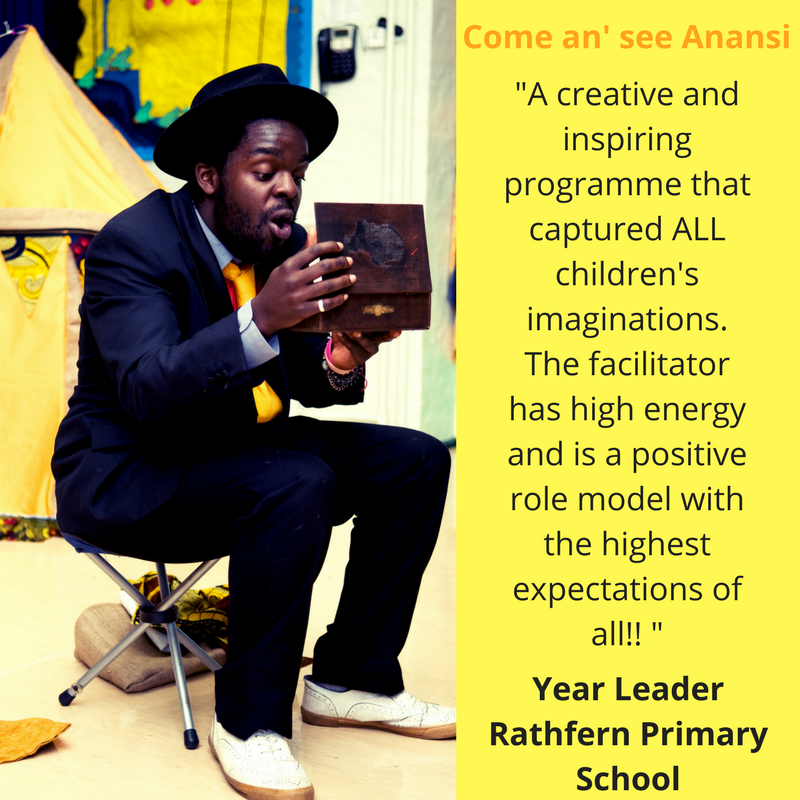 We were thrilled when Rathfern invited us to deliver Come an see Anansi because it is a core text they are learning this year. They said that the story telling aspect has allowed children to really understand the characters in the story and they’re looking forward to the writing they have planned. During the session Rathfern’s Head teacher was invited to the hall and observed the focus of some of the children who have specific learning needs and some behavioural difficulties. They said Adrian was completely inspiring and captured every child he worked with which is fantastic! The energy that ran through the hall during the assembly was inspiring and yet with 120 children present the content was clearly engaging as some of the schools most difficult children were completely engaged. They went on to say that Adrian has his expectations of the children which links with their own school ethos which is brilliant and important to us. The expectations of the children to complete learning beyond their years was fantastic and really encouraging. The children were really pushed to be themselves and are still raving about Adrian today. Amazing work Adrian! We’re proud to have made an impact and inspired young people which is why we love what we do. Our Creative Literacy programmes are available all year round, for more information click here.